The day after Halloween, stores like Target and Walmart slashed prices on costumes and candy corn to make way for artificial Christmas trees and holiday decorations. Before everyone had a chance to digest their turkey and cranberry sauce this past Thanksgiving, people were lined up to catch great deals at the big box stores. Stores used to wait for Black Friday to unleash a manic day of purchasing material possesions, but now our day of thanks has been compromised just for some deals, and Cyber Monday adds to the frenzy of Christmas shopping. Princeton is known for spreading holiday cheer. Performances of The Nutcracker and A Christmas Carol can be seen at McCarter Theatre. There’s the lighting of the Christmas Tree at Palmer Square and at the Princeton Shopping Center. Morven holds its Annual Festival of the Trees. A horse and carriage gives rides throughout downtown. Carolers sing and musician play in the Square, and there are sightings of Santa about town. Add the Christmas songs and TV specials about Rudolph and Frosty, numerous parties with mistletoe, eggnog and cookie exchanges, sending cards that read ‘Seasons Greetings’, and you’ll know that Christmas is but a mere national holiday for some. Even those of other religions put up a tree. This extreme commercialism has evolved from a few traditions and moments throughout history. Gift baskets were given in the north during the Yule season as part of the Winter Solstice, celebrating the return of the sun. These traditions were adopted by Christianity and were much simpler than those of modern day celebrations. Since Christmas has become an American holiday, it’s hard to ignore some of the fun, but for those who are Christian, it should definitely take a back seat to preparing for the coming of Christ. Everything in moderation. 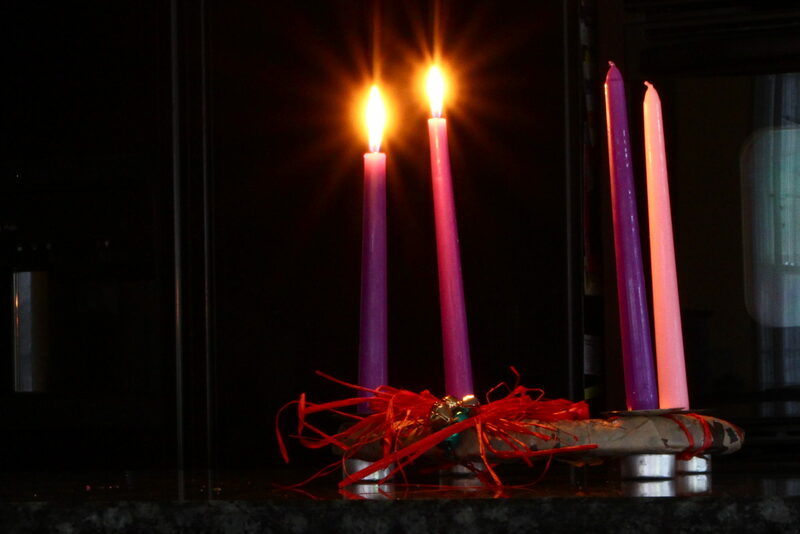 This coming Sunday is Gaudete (Rejoice) Sunday, marked by lighting the pink candle of the advent wreath. This indicates that our expected guest has almost arrived, and it’s NOT Santa. Great ways to observe Advent are to volunteer serving warm and nutritious meals at the Trenton Area Soup Kitchen or at our Cornerstone Community Kitchen, collect warm clothing or supplies for those in need, buy a gift for a needy child, or sign up to volunteer ringing the bell and collecting for the Red Cross (look for the sign up sheets near the office during the week). These are all great ways to open your heart, and prepare for commemorating the birth of Jesus. So, take back Christmas and bring back the true meaning of the season! This entry was posted in Lifestyles and tagged Advent Season, Advent Wreath, Christmas Season, Gaudete Sunday, Taking Back Christmas. Bookmark the permalink.